For information about supported Windows versions and detailed requirements, refer to Operating systems and Detailed Windows requirements. For information about which services get installed, refer to Services, dependencies, and folders (Windows, macOS, Linux). Go to the Sites tab and click on the name of the site you want to add your device to. Click on the New Device button in the top left corner of the page. A window with links to the Agents for the various supported platforms will open. Depending on the type of site you selected and whether you have added the Mobile Device Management extension to your account, you may see different logos in this window. For further information, refer to Methods for deploying Agents. Click on the Windows logo. Another pop-up window will appear. 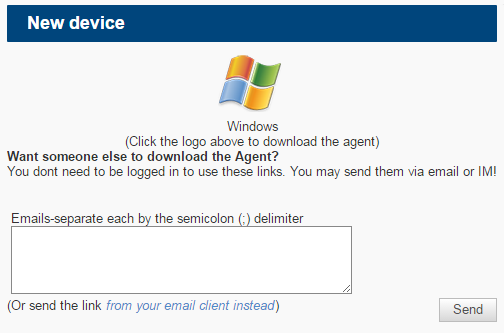 Click the Windows logo to download the Agent onto your computer, or enter an email address to email the installer file to another device. Open the downloaded or emailed file and install the Agent. The installer is silent so you will not see any progress bar or indicator. Once the Agent has been installed, the Datto RMM icon is displayed in the system tray of your computer. Please ensure that the .NET Full Framework is installed and the server has been rebooted before installing the Agent. For information about the .NET Framework requirements, refer to Detailed Windows requirements. In case you experience issues when attempting to install the .NET Framework, refer to this Microsoft article. Download the Datto RMM Agent as described in Install the Agent on Windows and save or copy the file to the server. Log in to the server as Administrator. In the server command line, navigate to the directory that the Agent installation file has been saved to. Invoke the name of the Agent installer (e.g. agent.exe) to install the Agent. Occasionally, the fastest way to resolve certain problems with the Agent is to fully remove it from the device and then reinstall it. However, many issues can be traced back to the .NET Framework itself, therefore, we recommend that you first run a ComStore component on the device to resolve any .NET Framework issues before uninstalling and reinstalling the Agent. Download the Microsoft .NET Framework Repair Tool component from the ComStore, and run it on the device you are experiencing an issue with. For information on how to search for and download a component, refer to ComStore. For information on how to deploy a component, refer to Jobs. If this step has not solved the issue, go to step 2. Navigate to Start > Control Panel > Apps & Features. 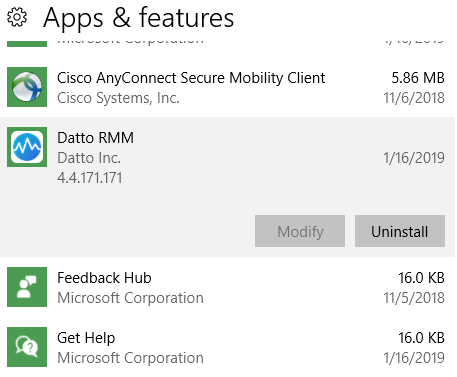 Select the Datto RMM application and click Uninstall. The application will disappear from the list of programs. The Agent has now been fully removed from your device, and you can reinstall it.